Qantas will open a new first class lounge at Singapore's Changi Airport and also increase the capacity of the current Qantas Singapore lounge, which will be rebadged as a business class lounge. 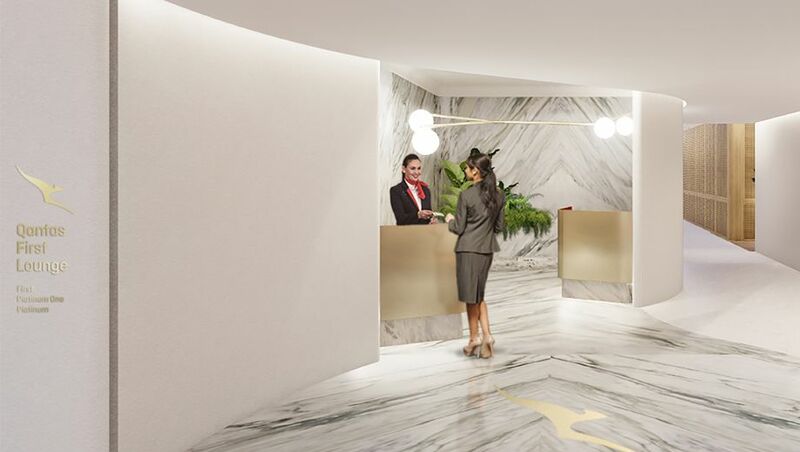 Due to open by the end of 2019, the new Qantas Singapore First Lounge will offer seating for 240 customers and "be designed to suit the specific needs of transit travellers, with shower facilities, a cocktail bar, open kitchen and menu offerings reflecting the best of Singapore’s vibrant dining culture," Qantas promises. 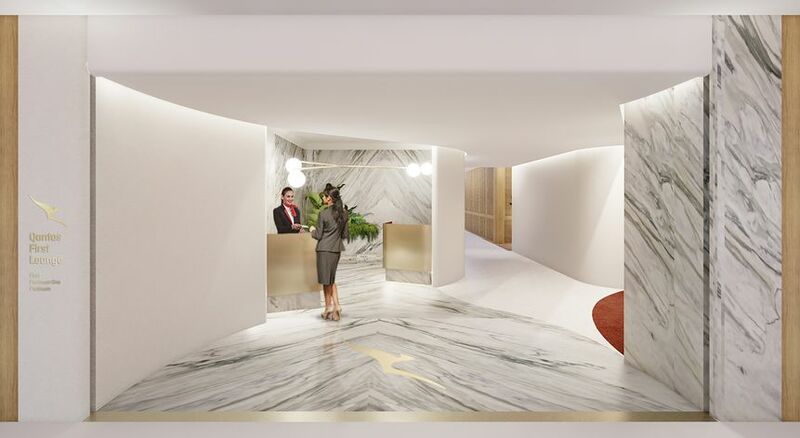 The new Singapore first class lounge will be designed by David Caon in collaboration with Akin Atelier with the aim of creating "a relaxing, high quality environment for passengers to either start their international journey or transit through Singapore." 'The design will embody a clear focus on sustainability with choices in materials, lighting interior, layouts and amenities all reflecting the highest local and international design techniques," the airline says. However, the first class lounge won't be located in the same vicinity as the current Qantas Singapore Lounge. A Qantas spokesman tells Australian Business Traveller that the new Qantas first class lounge will in Terminal 1's D Gates wing, whereas the Qantas business lounge sits in the C Gates precinct. To orient yourself: once passing through Changi's immigration and passport control checkpoint, turn left for the C Gates, and turn right for the D Gates (a number of Qantas flights are now departing from the D Gates wing due to increased traffic at Terminal 1). Entry will be open to first class passengers on Qantas' Airbus A380 flights along with Chairman's Lounge members, Platinum and Platinum One frequent flyers and their Oneworld Emerald equivalents. 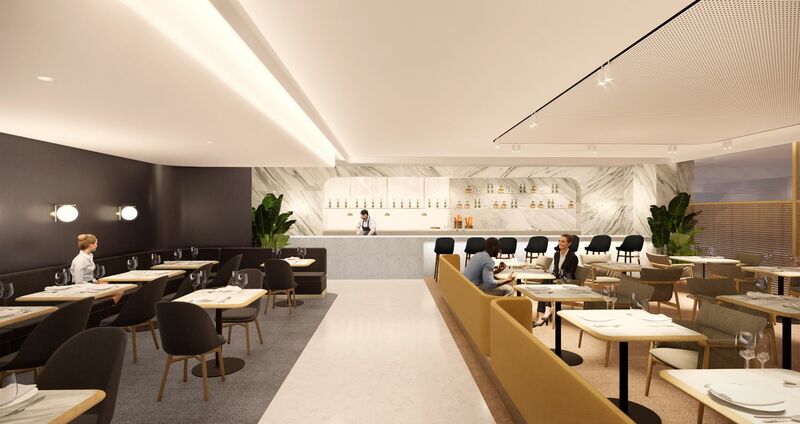 Qantas will also add more seating to its business class lounge by making use of some 'void' space within the lounge's current physical footprint. This is expected to add over 50 extra seats to the lounge while minimising disruption to existing travellers. The new first class and business class lounges will together provide seating for more than 800 travellers, representing a 60 percent increase in overall lounge capacity, while the redirection of Platinum-grade frequent flyers to the first class lounge will also free up a lot of room in the business lounge. Qantas' moves comes in response to continued over-crowding at the lounge since Qantas reinstated Singapore as the hub for its London Airbus A380 flights, which has recently seen Qantas Club card-holders and even some Gold-grade frequent flyers turned away from the lounge during evening peak periods. “With the return of our A380 service to Singapore we’ve got more passengers transiting through our existing lounge and strong demand for travel in premium cabins," Joyce adds. Work on the multi-million dollar project will begin in April 2019. I think this was needed a lot, good on you Qantas. As soon as the A380s are reconfigured, this will be all be up to a great standard. Construction to start in April 2019. I'd imagine the delay is around waiting for spaces to become available. Not exactly a huge amount of vacant space for lease in SIN. Great news and much needed! Brilliant! Is there a hint where the new lounge will be physically located? Sound like it will be near or maybe in the old CX lounge. Hallelujah! That's fantastic news. I wonder where it will be. We've updated this article with the location of the new first class lounge: it'll be in an entirely different part of the terminal, specifically the D Gates wing (current lounge is in the C Gates wing). They really should have anticipated this before sending the A380 back to SIN but nice to see some action. They probably did, but the issue will have been negotiating with Changi to get a suitable space. Will be almost 2 years too late! Should have been well underway in conjunction with dumping DXB as the stopover. Do they recruit their planning people from various state government Planning Departments? what about project sunrise? won't the lounge be redundant within 3-5 years? Depends what they do with the A380 once project Sunrise is underway. Will probably still fly it at least as far as SIN until the A380 are retired. I'd expect Singapore will remain as a stopover for passengers who don't want to fly non-stop from Sydney to London, in the same way that for example Singapore Airlines has retained a stop-over alternative to its direct A350 flights to New York, Los Angeles and San Francisco. But further down the track I'd not be surprised to see Qantas & Jetstar relocate to Singapore's new Terminal 5 when that opens.. It might be worth while doing a survey David (if you haven't already) of AUSBT readers, on their preference of taking a direct flight from SYD, MEL, BNE to LHR or with a stopover. I would think there will still be 4 QF flights a day (SYD, MEL, BNE, PER) though possibly on smaller aircraft. SIN will always be a destination in its own right, as well as a stop for those that prefer to do long trips in shorter leaps. And the QF F lounge will effectively become the F lounge (F, OWE) for all oneworld airlines. Great news, not so great design. Two concept photos, only one of which shows the inside of the lounge, and you can already pass judgement on the design? Impressive! This is great news, a contact at SIN tells me it's been underway for some time because the difficulty is getting suitable space. I believe the new First lounge location about two-thirds of the way along the D Gates precinct, close to and upstairs from the food court. This is not too far away from where the old Cathay Pacific contract 'SkyView' lounge used to be, if anybody can remember that. If the SkyView lounge is the same lounge I'm thinking of it was a horrible space, but in a great location between the C & D gates. Having recently avoided the QF lounge in favour of the relative calmness of the BA lounge, I look forward to being able to return to a hopefully great QF F lounge late 2019! Good things come to those who wait,,,,,,(sometimes longer than we want) but congratulations Qantas. Once the A380's are upgraded and hopefully a second daily flight out of BNE added to better link with QF1, this will be a great way to get to LHR. To those of us who travel often to SIN this is great news. There are enough choices (BA, Emirates etc) that will ease the congestion in the meantime. There is a shining light on the horizon and its not a train coming at us but a glass of champagne. Yeah!!! Looking forward to it. I am one of those who will happily break up the long journey - no 20+ flights for me. I'm with you Ross, no long flights for me, I always stop over a night in SIN and now I am looking for a suitable place to spend a night between SIN and Europe/London. Excellent move Qantas, just what you needed to do, nice for those of us who are OW Emeralds as well. I'm betting BA First passengers will be heading for this too. This announcement is very, very overdue. Many of us were saying what poor planning QF is guilty of when it comes to SIN. It is not all doom and gloom about the current Lounge. Recently I was flying SIN to HEL in Business Class with AY, on a Qantas ticket, so I had access to QF Lounge in SIN. The AY flight does not depart till almost midnight, as all the QF flights had departed it was quite pleasant and not crowded in the Lounge. Now for London and a space at least in the current lounge for F/Plats. Disappointing to see such disparaging comments here about some excellent news from Qantas. Yes, of course it's overdue and the fitout will inevitably take longer than planned. We all know that. But most of here look forward to a great new First Lounge in SIN. Very true. I am certain Qantas has known about the issues changing back to Singapore would create and would have been working on a plan since the day they made that decision. Many seem to think space can just be conjured up and built st a click of a finger. Also probably more correct to say it is taking longer than some (here) expect rather than longer than planned. The problem with that is that it doesn't appear that QF even started to work on the lounge issue until after the flight changes were already in force. The space issue was clear to everyone, besides apparently QF, the day they announced the DXB > SIN changes. If they had started working on the lounges when they announced the changes, then this new F lounge would likely already be open now, if not far off it. The issue was clear and my guess was expected, but how do you know they didn't start working on it straight away or even before hand? Just because it has taken almost a year to get to this point and another before it is open, doesn't mean it hasn't been a work in progress for some time and is dependant on the airport owner. Much needed and they knew something had to change with the return of QF1/2 and additional traffic through Singapore. Well done. Great news. Look forward to the opening. What a relief and hope they get it right! Nothing like LHR please which (for me) is simply horrible. AJ is right about the pre-flight experience, and for some folks (I fly >120 x per year) that means some space, some quiet and a light meal. In LHR there's the CX FLounge available which would make it harder for QF to justify a dedicated FLounge though maybe once Project Sunrise is in full swing hopefully with more flights to LHR than at present they may be able to consider it. A difficulty in LHR would be getting lounge space and getting enough passengers from partner airlines frequenting the lounge when there are so many OneWorld options already. I'm in the minority who bemoaned the move away from Dubai as the lounges there were superb. Good move by QF though. The last few times through SIN, I have taken refuge in the BA lounge to use the showers and freshen up there. This type of investment means QF is committed to running a one stop srevice to Europe via SIN. Just wish they would also do so via HK where I think the lounge is better than SIN. More than overdue. Travelled through from LHR in Sept in FIRST Class only to be told the lounge was full. You've got to be kidding! Asked why the small area usually reserved for P1 and Fist was not available - 'Oh its just we are too full' They have have more than enough time to sort this and only blind freddie could not have predicted it. Well done Q. Having developed offices and facilities (not airline lounges), I appreciate things take time and sometimes the negotiations seem to take an eternity. I wonder though, if attitude sometimes drives outcomes. I have come through Singapore on a number of occasions and while I don't fly 1st, am a ten-year P. I have gone to the SIN lounge when people are being turned away and been welcomed in, although with an apology that the lounge was full and finding a seat might take a while. In every case I found one, even though this sometimes meant sharing with other pleasant people. I've made some great friends this way. If there's not enough space in the current Qantas lounge in Singapore, give me 5000 air miles and I'll go to the alternative. Great idea and I'm a Gold level flyer and Life club member. Much appreciated but absurdly overdue. Why a company making so much profit allows itself to watch the Singapore combined lounge to become a nightmare is beyond me. If they’ve been working on it the whole time then expectations are high. Gets back to the simple fact that maybe they haven't had the space until now to be able to do it. Not everything is about budget and profits, sometimes shock horror there are practicalities and limitations, like lack of space. So many of you complained about DXB, yet the lounges are superb and IMHO far superior than anything the Q team could dream of creating. Emirates at least get the planning right. I'm EK platinum and would never ever take a Qantas code share flight to end up being unable to enter an overcrowded lounge or even worse, standing cheek by jowl with others waiting and competing for a seat. I can only hope for the sake of loyal QFF premium passengers that you will not be waiting into 2020 to experience the new lounges. The FlyerTalk Qantas group tags are jammed full of complaints, up there with the BA group! Compare them to other FT airline groups such as Emirates, and you'll see that the true Q quality is nowhere near the top! Comment on "Qantas to open new Singapore first class lounge in 2019"